Serendipity helps you create unplanned and unintended, but remarkable → innovative value by taking advantage of unanticipated, unexpected and unsought information and make accidental discoveries. 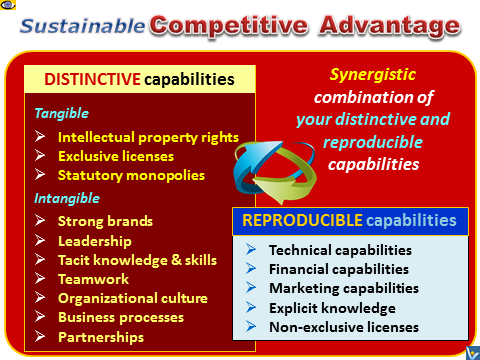 Sustainable competitive advantage is a product of → synergistic combination of corporate → capabilities. Distinctive capabilities help you stand out from the competition and are the basis of your competitive advantage. As a source of competitive advantage, a capability should be neither too simple that it is highly imitable, nor too complex that it defies internal steering and management. Although innovation is driven by technology, required competence extends beyond technical know-how. In the new knowledge economy and knowledge-based enterprises, systemic innovative solutions arise from complex interactions between many individuals, organizations and environmental factors. Long-term → corporate success depends on the → ability to innovate continuously, sometimes radically. You must move as quickly as the wind.